Previously on the Great British Bakeoff: Pastry, pastry everywhere. Richard won star baker for the third time while Martha just managed to squeak by and Kate got sent home. It’s the quarterfinals, folks! I really feel like this is anyone’s game. I think Nancy’s very likely to make it to the finals (unless she massively screws up this week), but as for the others, I feel like it could be anyone. It’s advanced dough week, which is like bread week, but at PhD levels, I guess. Richard recalls that his previous star baker wins have been followed by terrible weeks, so he’s a tad tense. Signature challenge: make sweet fruit loaves, free-form, from enriched dough. Ready, set, bake! This is a tough one. As the VO tells us, enriched dough takes a really long time to prove, because the butter, eggs, sugar and milk slow the yeast’s action down. Nancy’s trying to help her dough along by warming all her ingredients. Not a bad idea. Luis is making a black forest cherry tree based on the Bath bun. The buns will be in the shape of a cherry tree with a cinnamon trunk. Yum! Martha is working on a spiced plum iced bread swirl, filled with plum jam. Man, I love plum jam. And now, so does my six-month-old. He flat-out rejected the little piece of pikelet that didn’t have jam on it last weekend. The judges swing by Chetna’s and hear she’s been inspired by a Croatian bread that she can’t quite pronounce. Her loaf will be filled with dates and walnuts. It looks like scrolls stacked on top of each other, like logs, and apparently looks really pretty when sliced. Nancy’s calling her bread a ‘Lincolnshire plum braid’. It’s got apricots, strawberries, several spices, and marzipan in it. She’s finishing the first proof in the microwave, which Paul is very wary of. Yeah, I would be too. Microwaves get super hot, so you risk actually baking your bread. In the microwave. Ick. Paul tells Mary that doing that can destabilize the dough by wrecking the protein structure. Her dough comes out all puffed up. If this works, I’ll be super impressed. Richard is doing a play on Chelsea buns filled with pecans and apricots, formed into a ring. Paul thinks he’s got too much flour on the board, but Richard says his dough’s pretty wet. Paul gets his ‘that’s not right, man,’ look on his face. The Bakewells start rolling out dough and filling it up so shaping can begin. Sue can’t believe that Chetna’s leaving the ends of her dough rough, wondering if Paul will like it. Chetna says not neatening up the ends is the beauty of it. Wow, each of Luis’s buns is going to have a kirch-soaked sugar cube in the middle of it. That’s pretty intense. Next season, someone should really do that with absinthe, just to see how Paul and Mary react. Especially Mary. Nancy again pops her loaf in the microwave for a prove. The others use the proving drawers and look tense. Luis notes that everyone’s really quiet. Chetna’s first in the oven, since her loaf needs nearly an hour. The others soon follow. Nancy notes that hers is enormous. ‘Certainly bigger than…what I’ve done before,’ she says. Luis does that thing where the baker sits on the floor and stares into the oven. His loaf comes out, looking lovely. Martha’s not convinced hers is done and leaves it in a little longer. It’s pretty dark, which makes it look done even when it’s not. Sue spots Nancy’s loaf and declares it’s the size of a Labrador. Hee! Richard notes that his loaf is looking a bit wrinkly and wonders if it’s collapsing on itself. Paul comes over and sticks a finger in it, then backs away. ‘Too late now!’ says Richard as he pipes on some icing. Richard gets help moving his loaf to a tray from Nancy. Loaves are finished off and time is called. Martha’s looks really tempting, according to Mary, who also notes a slight leak on one side. They cut into it and it looks nice inside, with swirls of jam. It’s a little underbaked, though. Nice flavour. Mary wants some pieces of plum in there. Chetna’s looks unusual but Paul likes it. When cut in, there are all these nice swirls inside, but the top scrolls have kind of smushed the ones underneath. Mary likes the prominent cinnamon flavour, because she’s not really a huge fan of dates. Luis’s Black Forest cherry tree looks spectacular. Paul invites Mary to tear off a bun, and she cheekily responds that she hoped he’d say that. Paul compliments the crumb and the flavour, but he’s not crazy about the sugar in the middle. Mary likes it, because she appreciates originality. Also, booze. Nancy’s massive braid is either underproved or has damaged proteins, according to Paul. The structure’s ok, when he cuts into it, but it’s a little underdone. He suggests she make it longer and thinner. It tastes scrumptious, though. Richard’s fruit tea ring is a bit flat, because it was a really wet dough. But the bread is really wonderful and well baked. He’s wearing the sheriff’s badge this week. What’s up with that? So, nobody really seems to have screwed that one up at all. This is going to be a tough judging week, I think. It’s time for the technical. This week, they have to make…that loaf that Chetna played off of. Lucky her. She laughs. She’s kind of got it made, right? If she messes this up, she’s going to look really silly. She gets started while everyone else is still reading the recipe. Paul unveils his in the judges’ tent. It looks like a massive loaf baked in a loaf tin, but Paul explains that it’s a huge piece of dough rolled really thin, filled up, and then swirled around in the tin. He cuts into it and you can see four lovely swirls inside. Chetna says she’s never done a big roll like this before, so it should be interesting. The doughs are set in proving drawers. Nancy says she’ll go back to the microwave if hers doesn’t rise fast enough. While the doughs prove, the Bakewells mix up walnuts, butter, cocoa, and sugar into a paste. The proven doughs are removed and everyone starts rolling. They get it very, very thin—it reminds me of the strudel challenge from two seasons ago, and try spreading this incredibly thick filling on it. It’s a nightmare, because the dough is so delicate it’s hard not to tear it. Nancy softens her filling up in the microwave (of course) and pipes it on using an icing bag. Not a bad idea. Richard copies her. The doughs get rolled up and wedged into tins. Chetna pops her tin into the proving drawer. Sue helps Richard get his coil longer, bleating ‘how much length do you want?’ This is turning into a rather dirty episode, isn’t it? While everyone proves, Chetna’s already baking. Martha’s struggling with hers, trying to get it longer. She doesn’t have much time to prove this. Luis wonders where a beaten egg white mentioned in the ingredients goes. Nancy figures it’s part of a royal icing. Richard can’t fathom why you’d need royal icing. Luis thinks you’re just supposed to brush the egg white over the top. Richard does the same, because he can’t fathom why a sweet bread/cake thing would need royal icing on it. Luis takes his bread’s temperature while it’s in the oven and starts stressing, because it’s still raw inside. Yeah, that’s a problem. Nancy unmoulds hers and figures the ‘wow’ factor comes when it’s cut into, because it’s sure not wow-esque now. Loaves start coming out fast and furious. Martha thinks hers looks ok—not amazing, but not awful. Luis finally takes his out and frantically fans it to cool the loaf. Martha, Chetna, and Nancy pipe icing over their loaves. Probably because he saw Chetna doing it, Luis copies. Time is called and the loaves are presented. Luis has piped a really intricate design on his. Show off. (Kidding—I actually like Luis). In come Paul and Mary. Paul notes that Luis’s is underrisen. He cuts into it and sees that the filling hasn’t been evenly spread and the bread wasn’t baked long enough. Mary says the walnuts have a nice crunch, though. Nancy’s is massively underproved and raw inside. The layers and filling are irregular. Paul actually advises Mary not to eat it. Yikes. Chetna’s is pretty good flavour and texture-wise. Martha’s is totally raw inside. Another one that can’t be eaten. Richard’s is a little lopsided in its shape and raw in the middle. Wow, guys. Last to first: Martha, Richard, Nancy, Luis, Chetna. Amazing! Chetna’s all excited because this is the first time she’s come first in a technical. But she adds that she would have been seriously embarrassed if she hadn’t come first. Before the next day’s bake, the judges confab. They agree that Martha and Nancy had tricky days the day before. Mary says that Martha needs to do brilliantly to pull herself back up. Time for the showstopper: they have to make doughnuts. Mmmm, doughnuts. I started making the doughnuts from Justin Gellatly’s book and they are AMAZING! Seriously, totally worth the trouble. 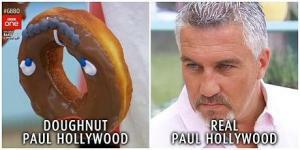 Paul says he’s probably made 30-40,000 doughnuts in his day, so he knows what a good doughnut is like. Mary is looking for innovation. Luis tells the judges he’s making cocktail doughnuts. Mary’s face lights up. One is a mudslide with an irish liqueur centre, and the other is a mojito doughnut with raspberry and mint jam. I’d definitely eat that second one, and I don’t usually go for jam/jelly doughnuts. Nancy is making an orange-flavoured dough. Chetna is making South African-inspired doughnuts with potatoes in the dough of one and chocolate mousse in the other. The potato dough ones will be dipped in a ginger and spice glaze. Martha’s attempting a cronut with lemon and poppyseed as well as chocolate and passionfruit doughnuts. Her dough proves in the fridge to keep the butter solid while everyone else uses the proving drawers. Luis makes his jam and interviews that he thinks you should have jam in a doughnut. Richard tells the judges he’s making a doughnut with toffee apple and another one that’s heart shaped and filled with rhubarb jam. Cutsiness aside, I would eat both of those. By the half dozen. Mary looks charmed. Oh, man the toffee apple ones have salted caramel topping. Mmmm. Nancy is filling one of hers with limoncello cream (for grownups) and chocolate doughnuts (for kids). Cute. She plans to decorate the kids’ ones with a face and spiky hair, which Paul notes could be a reference to him. Martha’s having fun playing with her dough. Richard start cutting out his doughnut hearts. The others form balls and braids and things, then start working on decorations and fillings while the dough proves. Martha overproves the hell out of hers and freaks out. Doughnuts go into the deep fat fryers. Chetna uses a pan filled with oil, probably remembering the disaster Kate ran into last week. Martha’s are coming out super flat, not lovely and tall the way they did at home. Oh, dear, this may very well be it for Martha. Some of the Bakewells use syringes to fill their doughnuts. Mel suggests Martha just fill her flat doughnuts up with tons of curd. Luis sticks straws in some of his doughnuts and fills them with Bailey’s. Sue grabs two of Nancy’s doughnuts and starts imitating Paul. Doughnuts are dipped and arranged on displays. Time is called, Richard shoves one of his spares into his mouth. Richard’s got his rhubarb and custard and toffee apple doughnuts arranged in packing cases. Mary’s disappointed to see that the caramel glaze kind of ran off everywhere. Rhubarb and custard has a good fry on it and kept their heart shape. Paul calls them ‘cracking’ and notes a little zing from the rhubarb. With the caramel, again, the colour is lovely and Mary loves the flavour. Paul says these are really professional. Richard’s happy with that, as he should be. Nancy’s calling hers a doughnut family tree and actually has the doughnuts hanging on little branches, which is cute. Mary thinks it’s fun. They have a slightly irregular colour and were fried a little too long, but the limoncello cream is really nice. The kids’ ones look a bit better but are slightly overdone when Paul tastes them. Martha’s poppyseed one is definitely overproved but have a good amount of poppyseed. The chocolate and passionfruit have a very light colour but taste pretty good. Paul says she has two great tasting doughnuts but fell down on the texture and colour. Chetna’s braided doughnuts are really fatty, according to Mary but have a lovely flavour. Nice chocolate work on the others but the filling is more ganache than mousse—too thick. Luis has a great display—the Bailey’s doughnuts are settled in martini glasses, and the raspberry mojito ones have raspberries skewered into them. Mary notes that they’re a little unevenly cooked. The icing on the raspberry ones is good and Mary tastes the mint. Paul cuts a couple open, thinking they’re overproved, but they’re fine. Mary takes a sip of the Bailey’s one and is sold. ‘I don’t know why we’re bothering with the doughnuts,’ she says. Unfortunately, the cream centre made the doughnut soggy. But Mary loves it, of course. Paul really loves Richard’s doughnuts, while Mary appreciates Luis’s originality. They liked Nancy’s tree but Paul has issues with the dough and the bake. Martha’s doughnuts tasted ok, but had serious issues. But they know who has to go. I think we all do. So much for this being a difficult judging week. Back in the tent, Mel gets to announce star baker—in a Bakeoff first, it’s Richard, for the fourth time! So he gets to keep the badge. Ahh, ok, the badge is explained. Sue announces that the person leaving is Martha. She knew it was coming. Sue reminds her that she’s 17 and is amazing and will rule the world. She really did amazingly, and she was such a nice, cheerful seeming person! Mary’s sure her name will crop up again. I’m sure it will. Paul takes a moment to reassure all of us that the judges do not have any favourites and it’s anyone’s game, seriously!